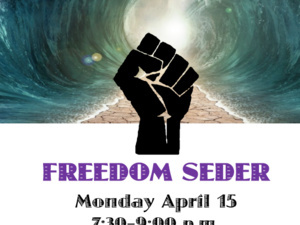 Join us for a Freedom Seder, created by students and facilitated by Koach Baruch Frazier, a spiritual guide and activist working at the intersection of antisemitism and antiblackness. The Freedom Seder is an intersectional exploration of the Jewish Passover seder (ritual and meal). This pre-Passover experience will bring diverse student voices into dialogue with teachings about liberation, based in the ritual retelling of the book of Exodus, and set against the landscape of contemporary racism in the United States. All are welcome, and diverse backgrounds encouraged.